In every company, people are hired and given a position that matches their talents and skills. But how can you ensure that new hires are placed in the right position? Simple. Use a competency evaluation test to determine an individual’s potential in key areas, and create a better employee profile. This profile can then be matched with a suitable position or used to map a personalized development plan. 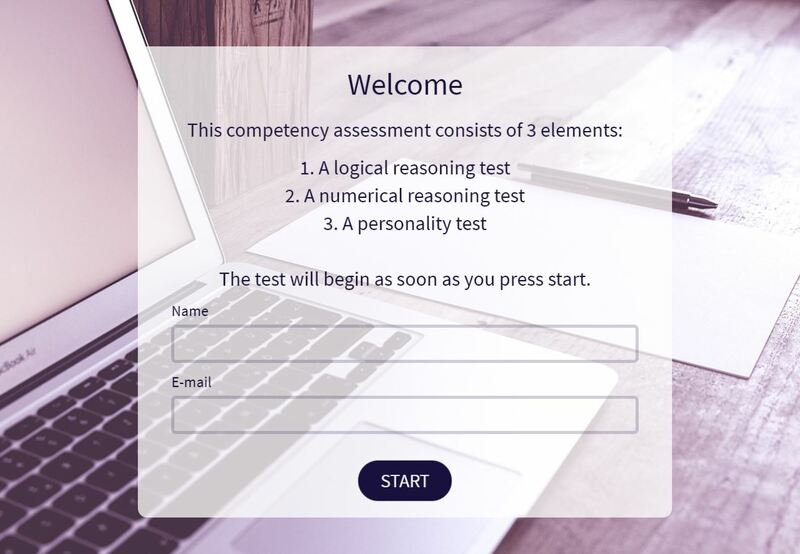 To customize the competency assessment template on this page, sign up, go to our examples page, and choose ‘Competency Assessment Template’. It's that simple. What is a Competency Evaluation? In the most basic sense, a competency evaluation, or competency test, reveals a job candidate’s key skills, talents, and areas of weakness. And having this information puts you at a key advantage – you’re able to better fit an open position to a candidate – and ensure that they’ll be successful in their role. This means fewer resources will be spent on costly employee turnover, and you’ll have a more productive, happier workforce. They improve recruitment efforts. Competency tests are a great aid to HR when searching for new personnel because they provide an objective screening, analysis, and profiling process. HR can build a specific profile for an individual and their unique values and skills. This profile can then be used to identify the position that a candidate would be best suited for within the organization. Professional development needs. Employees can be analyzed and benchmarked against their job profile to determine where extra input and improvement is required. This data can be used to create personal development plans to help an individual’s career growth. Continuous development. Competency tests also play a role in improving the general workflow and efficiency inside the organization. If clear objectives and standards are set around a certain competency or test score, they will act as an internal motivator and a goal for the employees to work towards. This, in turn, stimulates productivity, and ultimately, revenue. Increase in job satisfaction. As mentioned before, competency tests will enable the individual to recognize the talents they possess and inspire them to take their careers to the next level. Competency assessments will act as an internal motivator and lead to an increase in job satisfaction as the individual can track their personal improvements and enjoy professional growth as a direct result of their efforts. Why use Survey Anyplace as part of your Competency Assessment Process? Fast data capture on tablets and smartphones, thanks to mobile-optimized templates. Your assessment experience is our priority. Deliver employee reviews directly to the right mailbox. Share your employee reviews with Email Invitations and stay in touch with automated follow-up emails. For the love of data! Take your reporting to the next level with all possible Data Filters you could ever need, Share Reports publicly or privately, set up Real-time Presentations and effortlessly export to a CSV or excel file. NEW: Send a personalized report with feedback on each respondent’s performance with our automated PDF generator. To customize this template after signing up to our professional trial, choose ‘Competency Assessment Template’ when creating a new survey. Clear assessment goals: What are the results going to be used for? Who is the test made for? It is important that the employee encounters no practical barriers whatsoever while taking the test: Mobile devices such as a tablet or smartphone are ideally suited increasingly the device of choice when it comes to taking assessments or questionnaires. Our software is fully mobile optimized for smartphones and tablets and is guaranteed to provide a user-friendly experience. Competency assessments through paper forms, pdf or word documents is also possible but has the disadvantage that the data still needs to be transferred to a central system as a separate action, which is a tedious and error-prone task. To get the most accurate, honest results, it’s important to reduce barriers to completion as much as you possibly can. Survey Anyplace software provides assessment templates and questionnaires that are already mobile-optimized for smartphones and tablets, so respondents can easily answer on their own device, at their own pace. We’ve designed these tools to be user-friendly, making our surveys and assessments simple to use, share and answer. Of course, some companies still use paper forms, PDFs or Word documents for their competency assessments. While for many it’s a case of ‘that’s the way it’s always been done’, these methods aren’t without their own challenges – the most important being the need to transfer the collected data to a larger, central system as a separate action, which not only requires additional resources and analysis but can result in errors during data-entry. These terms are commonly used interchangeably. Though both of these are measures that a company can use to know whether or not a person fits the job they are doing, they actually look at different areas in order to provide the results needed by the company. a competency assessment deals with the ability of an employee to perform his or her task, while a performance evaluation is mainly focused on the work performance of an employee. A competency assessment answers the question on what the attributes of an employee are that can help them do the job, while a performance evaluation answers the question on how a person specifically performs with regard to his or her job. A competency assessment focuses on key attributes a person has, while performance evaluation focuses on the job processes of an employee. A competency assessment is more of evaluating the input that an employee already has while performance evaluation is the process of knowing the output that an employee can provide. Guide, gauge and grow your workforce with our competency assessment template!